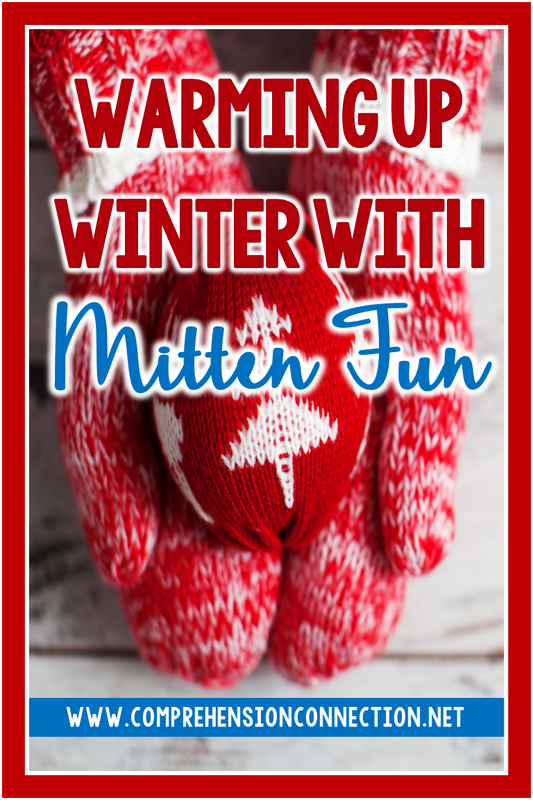 Celebrate winter with a fun mitten theme. 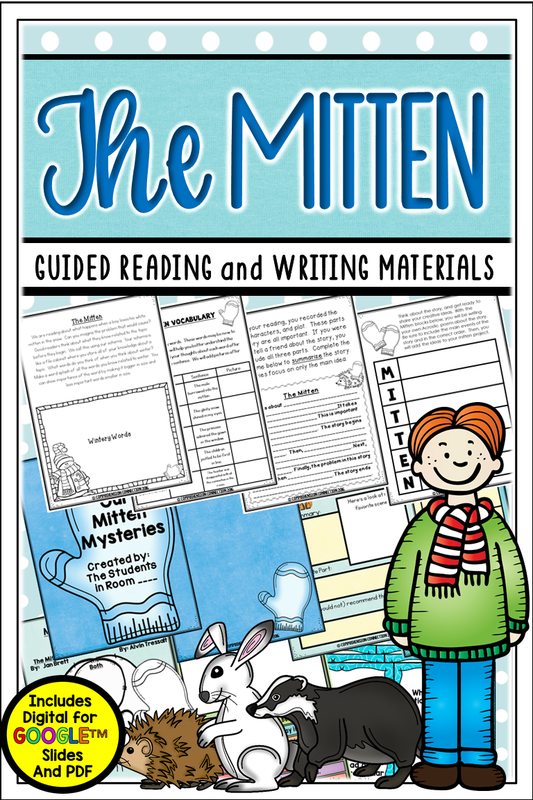 Imagine how excited your students will be with great mitten literature, craftivities, and more. Surprisingly, there are many mitten themed options to choose from. 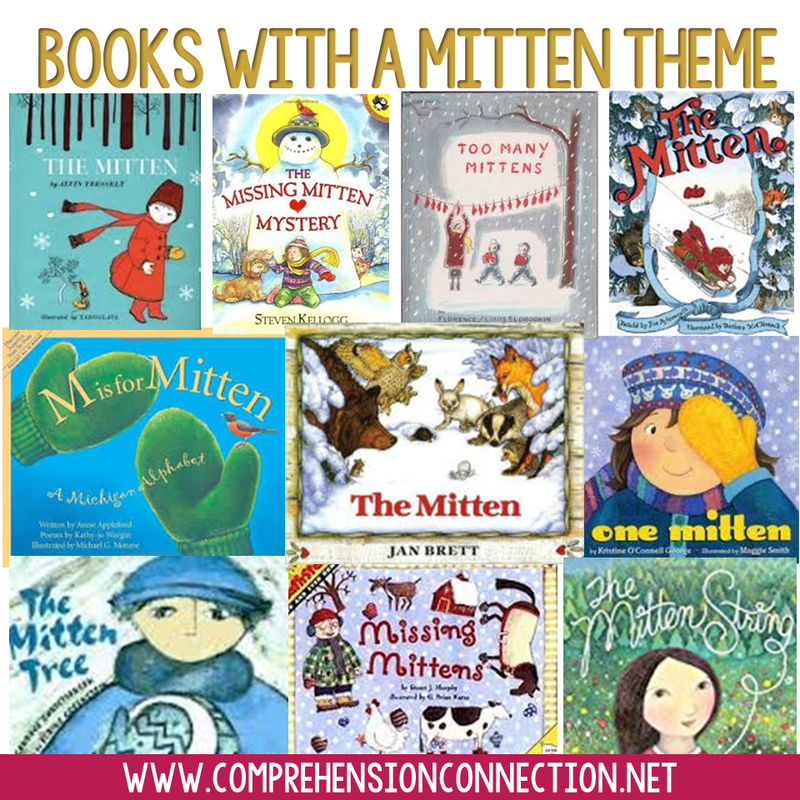 When I began thinking out this theme, I immediately thought of a few mitten books I have used. My favorites have been the two versions of The Mitten of course. The most popular version is The Mitten by Jan Brett, but there is also the title by Alvin Tresselt. Besides The Mitten, I also love The Missing Mitten Mystery by Steven Kellogg. In fact, it is the inspiration of the partner script that I've developed for paired and guided reading. 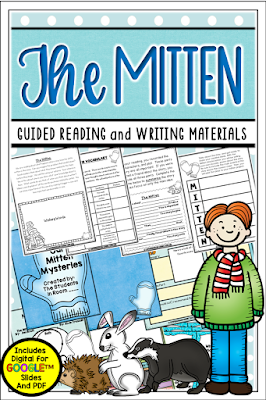 The Missing Mitten Mystery is a great choice for late second to fourth grades. It's about children playing outdoors in the snow and losing a mitten. Imagine that! In my house, mittens have a life of their own. I think at night they secretly grow wings and fly up the chimney, and have you noticed that you never find the match?? Truly, I do not know where they go. All of these books work well as mentor texts for writing. I love Jan Brett's description, and the details help the reader truly visualize the scenes. 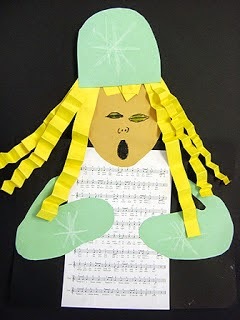 Children can imitate her writing with their own stories about mittens, winter play, or a beautiful walk in the woods. 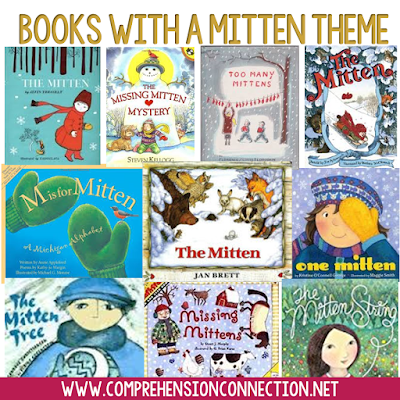 Other books that work well into the theme are The Mitten Tree by Candace Christiansen and One Mitten by Kristine George. Besides books, you and your students may enjoy the partner play I mentioned earlier. It is set up to address fluency, but also works well as a Close Reading activity. The question task cards can be copied for each pair of students to respond to or used as a guide for post reading discussion. 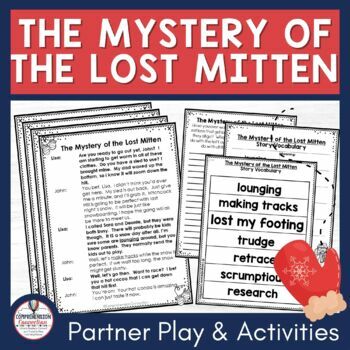 This script includes prereading activities, a graphic organizer for during reading, and a post reading writing prompt where students can write their own Lost Mitten Mystery, a story summary, or another winter prompt of the teacher's choice. Another option from my store during Mitten Week is my unit for The Mitten. It includes materials for various comprehension skills (summarizing, story elements, sequencing, and making comparisons), vocabulary building, writing prompts and a class project. I've been very fortunate to meet and get to know Leslie Goldhardt who enjoys making clip art. She created a custom clip art set for me to use with this book. I absolutely love her hedgehog and badger. They look so cute! Check out the preview to the right. Notice that this unit is now available in both PDF and on Google Slides (in color). Your students can use them on their one-to-one devices for paperless work. Before I sign off, I thought I'd highlight a few of my favorite pins from Pinterest. What did we do before Pinterest, right?? They are all pinned to my Mitten board, and you can find them easily by clicking the board widget above. 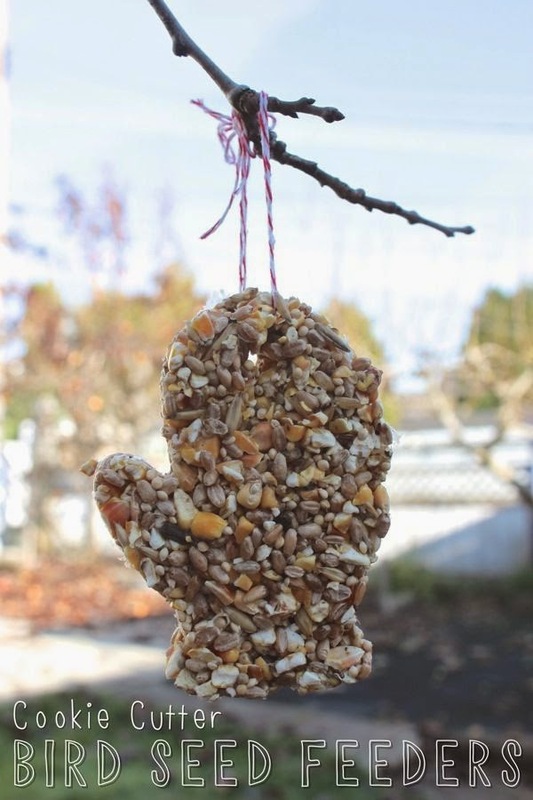 If you have resources readers need to know about, you can link them up directly (free only) or write up a blog post telling about them and your mitten themed ideas. This is a wonderful theme to explore throughout the winter, and I hope these ideas and resources will help you get started and make planning easier. With a mitten week, you can easily include cross curricular activities. 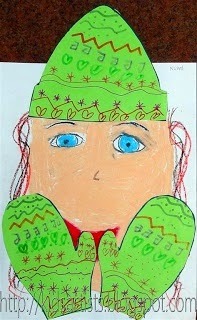 Be sure to check out the Pinterest board above for all kinds of ideas and lots of mitten fun! To celebrate your favorite winter books, I created this Mitten Shaped Book Review. Have your students complete one about their favorite book, have them share it with a book talk, and then display them for all students to see. Just subscribe below, and this paid resources is yours. 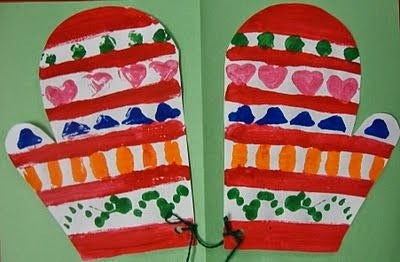 Thanks for all the fun Mitten ideas! 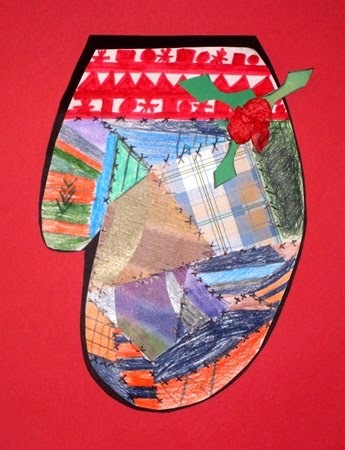 The Missing Mitten Mystery is one of my favorites! Thanks for dropping by, Kim. Sorry the post was such a wreck when you visited. I have revised it. :-) It was late, and I had to get it up. I didn't get to proof as a normally do, and unfortunately, it had code in it from a previous post. EEk! LOL! 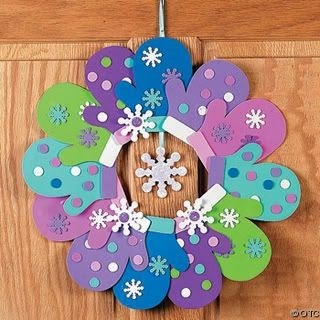 I just liked seeing your Pinterest board widget in use! Awesome! I am the queen of late night goof ups! It's BAD. I love your Thematic Thursdays! Hope to link up more in the new year. 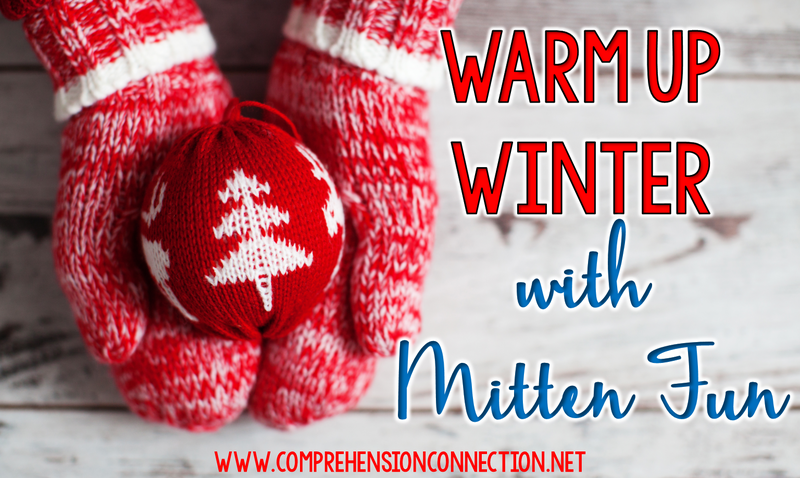 I love mitten activities! You have some treasures here! I pinned this post for future reference. Thank you! I'm glad you linked up, Stacy! I noticed your freebie as I was perusing others for my post. :-) Have a great Christmas and looking forward to cyber fun in the new year.